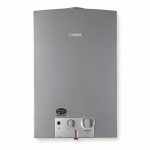 If you're in the market for a tankless water heater, there's nothing like a natural gas unit to keep your taps nice and warm. They're powerful, whole-house systems that can service multiple bathrooms at once, and what's more, they'll last for decades if properly maintained. But what if you've never purchased a tankless water heater before? Or what if you're just unsure which brand is the best? 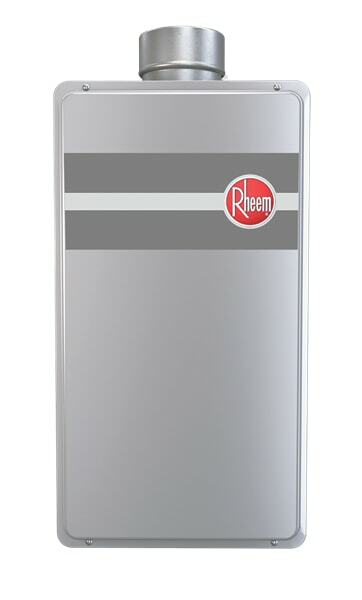 As a certified HVAC technician, I'd like to offer my recommendation for the Rheem RTG-84DVLN 8.4 GPM Low NOx Direct Vent Tankless Natural Gas Water Heater. Not only will it give you all the benefits of a standard natural gas unit, but it also comes with a few additional perks as well, ones that make it well-worth the asking price. Let's look at the RTG-84DVLN together. The RTG-84DVLN offers several very inciting numbers, so I'd like to break them down one by one. Flow: This unit offers up to 8.4 gallons per minute (GPM) depending on where you live and how warm you want your water to be. If you live in an extremely cold climate or if you like your showers scalding hot, your GPM might be a little less. Power: The RTG-84DVLN can require between 11,000 and 180,000 BTUs. If this seems like a wide range, you're right! The power, efficacy and energy efficiency of the RTG-84DVLN will all depend on where you live. Again, colder climates can expect slightly less in the way of performance than warmer climates. Size: The RTG-84DVLN weighs in at 54 pounds. 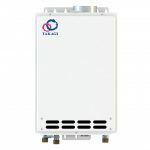 While this isn't as compact as portable or electric units, it's relatively small for natural gas, and it can be installed without taking up a lot of space. As previously mentioned, natural gas units are some of the most powerful on the market. This is because of the way they warm their burners and heat exchangers with live flames. The trade-off for this powerful performance is the need for ventilation to keep the fumes at bay; you don't want harmful fumes to build up and seep into your general air supply. Unlike other natural gas models, however, the RTG-84DVLN does something a little different with its ventilation system. It offers a special low NOx system that means you can install your unit indoors. That's right: You don't have to stick your RTG-84DVLN outdoors and leave it vulnerable to the elements. You can install it anywhere there's sufficient air flow, including inside your home. The max setting of the RTG-84DVLN is 120°F, though you can use the remote control to increase that number by 20°F if necessary. In terms of flow rate, I hate to sound like a broken record, but it all depends on where you live. The colder your pipes, the harder the unit will have to work. You should only expect to receive the full 8.4 GPM if you live somewhere with a moderate climate. The good news is that even 5-6 GPM is enough to give you instantaneous hot water in multiple bathrooms. It doesn't matter if you're trying to shower, run the dishwasher and do a load of laundry at the same time; the RTG-84DVLN will accommodate your needs. The RTG-84DVLN comes with several parts already included, so you won't have to worry about things like remote controls and thermostat wire. 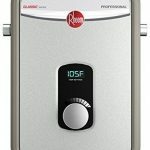 Rheem has you covered. In terms of actual installation, the RTG-84DVLN isn't that difficult, though I always advise my customers to let a trained technician handle things just in case. If you're determined to DIY the project, however, it shouldn't put up too much of a struggle. Like any tankless water heater, there are both pros and cons to buying the RTG-84DVLN. You should consider both sides carefully before making your final purchase decision. All in all, if I had to rank the RTG-84DVLN, I'd give it four out of five stars. It isn't a perfect unit, but it's more than enough to meet the needs of most modern homeowners, and it might last 20 years or more before it needs replacing. 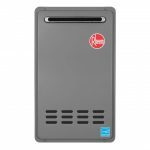 If you're looking for a tankless water heater that will perform admirably for a long, long time, check out the RTG-84DVLN on Amazon. TanklessHub.com is a participant in the Amazon Services LLC Associates Program, an affiliate advertising program designed to provide a means for sites to earn advertising fees by advertising and linking to Amazon.com.